America's Garden Book There are very few garden books that have lasted like America's Garden Book--and with good reason. 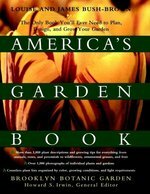 Since its first edition in 1939, the book has been specifically geared to North American backyard, do-it-yourself gardeners and their particular needs. The Plants More than 3,000 plant recommendations are listed throughout the book. Chapters devoted to specific types of plants go one step further, offering multiple listings based on the particular merit and special growing habits of certain plants. Appropriate plants for every garden situation are offered from disease-resistant climbing roses, water lilies for pond gardens, or rock garden plants. The Techniques There are instructions for constructing various paths, walls, steps, and grading structures. Detailed plans are included for naturalizing a prairie, constructing compost bins, and arranging indoor lighting systems. The Photography More than 1,000 photographs illustrate everything from more than 60 roses to the step-by-step of dividing a lily root clump. Each chapter contains scores of identification photographs to help the home gardener choose the ideal plants for the garden.